Mechanically, Josu reminds me of Korlash, Heir to Blackblade from Future Sight: a strong mid-game creature who becomes downright insane as the game goes on. If anything, he’s even harder to deal with than Korlash is: ten mana might sound like a lot for any format other than Commander, but all those tokens have menace and there’s basically no way any normal deck is going to be blocking them at all if he resolves after being kicked. Plus, you know, Cabal Stronghold is in the same set as him! There’s not as much history behind Josu as there was for Korlash; he’s Liliana’s brother who she accidentally killed while trying to treat his illness, but evidently not truly gone. However, since he is/was a servant of Belzenlok, and given Liliana’s connections to the Gatewatch and to Nicol Bolas, that means he has a disproportionate impact on modern events for one man/zombie. I think it’s also fun to note that technically we’ve seen him as a human on cards from Magic Origins – see, for example, Tainted Remedy. Oh Kicker, how I missed you. Kicker is up there with Landfall as one of the all time greatest mechanics. Kicker cards usually fall into two categories. The first is a pure upgrade where a card can be cast early game or late game and be impactful. The second is utility abilities such as destroying certain permanents. Its up to a player’s skill to determine which mode is best to cast when and where. As foreshadowed in M25’s Will-O’-The-Wisp, things did not go well for the Vess family after the events of Magic Origins. Between “Final Parting’ and “Settle the Score” Liliana is going to accumulate quite the body count on Dominaria. On to the card itself. A 4/5 with menace is pretty good, and creating eight tokens is a game winner. The real appeal though is creature typing. Limited has White-Black Knight tribal support while Zombie is one of the most supported tribes of all time. I mentioned that this card kicked is a game winner, but with a Death Baron or Liliana’s Mastery on the table you can even straight up win a multiplayer game. The fun thing about a Commander with Kicker is that you can cast him for his initial cost, then a few turns later kick him. Although mana intensive, getting multiple triggers is pretty diabolical. I’m sure there’s a slightly rude joke to be made about liches, but this isn’t the place for such jokes. This is the place to review Liliana’s brother in card form, an undead knight in service to Belzenlok. And he’s pretty good, at the very least. Let’s look first at Josu Vess without kicker. A 4/5 for 4, with menace, is a pretty good deal and a bit better than black’s usual rate of return (though short of its peak). If you have to cast Josu on curve, he’ll win you games rather nicely, as an evasive attacker with a solid body is hard to really deal with. If he was just the 4/5 for 4, he’d be a solid card, though a bit weak for a rare. With kicker, Josu gets a bit more interesting…when you get there. This is a 10 mana investment with a massive payoff, giving you 20 power on board on successful resolution. And not just 20 power…20 power with menace. 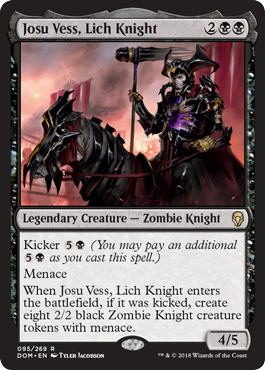 Kicked Josu Vess is an excellent way for a deck in black to try and close out the game on the next turn, though it is weak to board wipes of just about any kind. But such is always the risk of a go-wide strategy, right? I feel like Josu’s apt to make some manner of impact on Standard. He’s good outside of it, but he’s good both early and late, which gives a measure of flexibility that’s nice to have in any card.